Over that [painful five-year] period, the fund averaged an annual 10% loss—brutal, though it was one of the smallest logged over the period among the largest commodities funds tracked by Morningstar. And over the past year, as commodities flirted with a recovery and then pushed ahead, its 5% return has beaten 90% of its peers. The prospectus benchmark for the fund is the Bloomberg Commodity Index – Total Return. While there are no ETFs implementing this index, there are two ETNs that do: the iPath® Bloomberg Commodity Index Total Return℠ ETN (DJP) and the ETRACS Bloomberg Commodity Index Total Return ETN (DJCI). Although DJP has a longer history and more assets, it also has a higher expense ratio than DJCI. Alpholio™ calculations show that since December 2010 the fund returned more than DJP in approximately 88% of all rolling 36-month periods, 73% of 24-month periods and 61% of 12-month periods. The median cumulative (not annualized) outperformance over a rolling 36-month period was 3.7%. From December 2010 (the first full month since its inception) through July 2016, the fund failed to outperform its reference ETF portfolio, which had a substantially lower volatility. The RealBeta™ of the fund, measured against a broad-based domestic equity ETF, was comparable to that of a traditional balanced portfolio. Despite comparable Sharpe and Sortino ratios, the fund had a lower annualized return, as well as higher annualized standard and downside deviations, than the annually-rebalanced reference ETF portfolio. Since its inception, the Invesco Balanced-Risk Commodity Strategy Fund failed to add value on a truly risk-adjusted basis. The fund could effectively have been substituted by a simple ETF portfolio with fixed weights and infrequent rebalancing. The fund’s steep front load further detracted from its appeal. The fund had only a couple of small dividend income distributions, which made it suitable for taxable accounts. To learn more about the Invesco Balanced-Risk Commodity Strategy and other mutual funds, please register on our website. … [the] fund has, for the past decade, outperformed 73% of small-blend funds with less risk than 75% of that group. The fund’s style-specific benchmark is the Russell 2000® Index. One of the practical, long-lived implementations of this index is the iShares Russell 2000 ETF (IWM). Alpholio™’s calculations show that since September 2004 (the start month of the current manager), the fund returned more than the ETF in about 47% of all rolling 12-month periods, 48% of 24-month periods, and 62% of 36-month periods. However, this type of comparison to a single benchmark does not adequately account for the fund’s risk or composition (the article mentions a 92% active share). Since September 2004, the fund produced a negative 0.61% of regular and negative 0.42% of lag annualized RealAlpha™ (to learn more about RealAlpha™, please visit our FAQ). These statistics do not take the fund’s front load into account. At 17.76%, the fund’s standard deviation was slightly higher than that of the reference portfolio. Underscoring the fund’s volatility was the RealBeta™ of 1.12. The fund had top equivalent positions in the above-mentioned iShares Russell 2000 ETF (IWM; constant weight of 27.4%), iShares S&P Small-Cap 600 Growth ETF (IJT; 16.5%), iShares Russell 2000 Growth ETF (IWO; 16.3%), iShares S&P Mid-Cap 400 Growth ETF (IJK; 7.2%), iShares Morningstar Small-Cap ETF (JKJ; 7.2%), and iShares S&P Small-Cap 600 Value ETF (IJS; 6.3%). The fixed-income holdings of the fund were collectively represented by a 5.1% position in the iShares 1-3 Year Treasury Bond ETF. The reference portfolio was rounded out by three additional ETFs with smaller weights. Under current management, the Invesco Small Cap Equity Fund could have effectively been substituted, and with better risk-adjusted performance, by a fixed portfolio of a handful of small-cap ETFs. After accounting for a substantial front load, the fund’s would subtract even more value. An addition, the fund’s relatively large distributions (14.6% of the NAV in 2014; 6.5% in 2013) made it more suitable for non-taxable investment accounts. To learn more about the Invesco Small Cap Equity and other mutual funds, please register on our website. Nevertheless, the chart shows that from the beginning of 2010 through August 2013, the total return of the fund was still higher than that of its average peer in the Target Date 2026-2030 category. Morningstar also reports a three-year (to August 31, 2013) Sharpe Ratio of 1.14 and 0.97 for the fund and its category, respectively. While the return of the fund was lower than the category’s average, its volatility was even more so thanks to the relatively high bond position. In 2012, the cumulative RealAlpha™ started slowly increasing. Currently, the fund has top three equivalent positions in iShares Core Total U.S. Bond Market ETF (AGG; 46.4%), PowerShares QQQ™ ETF (QQQ; 24.5%), and iShares MSCI Singapore ETF (EWS; 12.8%). As a previous Alpholio post indicated, when interest rates rise, correlations among stock, bond and commodity returns increase; hence, risk parity strategies tend to underperform. This negatively affected the fund in mid-2013. 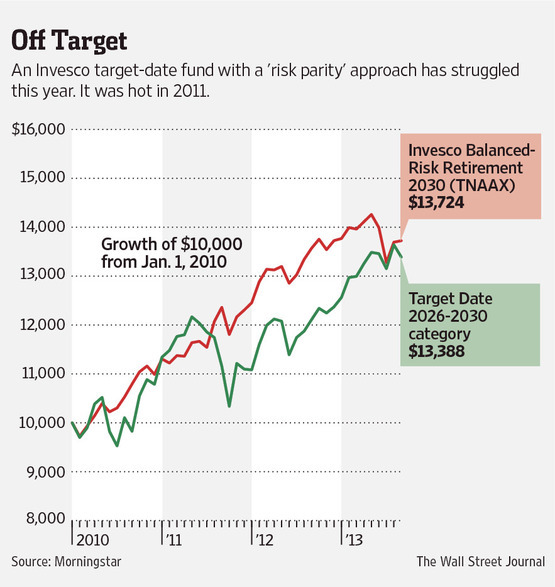 However, longer-term performance of the fund since its adoption of the risk parity approach is moderately encouraging.